ICTCore is a unified communication framework which works as back end server and offer its services via REST based APIs, to read more about ICTCore please visit the official website ICTDIALER. This angular based application acts as client to ICTDIALER, and offers basic functionality like managing messages, creating different kind of transmissions: SMS, emails, fax and voice calls. Here's a brief instruction and user guide for this application. To start the application visit the link, a window will appear and it will ask for the username and password. Fill the required fields to Sign in. Manage all contacts, texts, voice recording, send fax, send call and much more features. Once you have logged in successfully it will redirect you to the Home page. Go to the Text Messages. Choose the type of message you want to send i.e SMS, Email, Fax, Voice Call. Create the message of your choice (For more details See Text Messages below). After creating the message, Choose the desired transmission, i.e if you want to send the SMS click Send SMS in Transmission Management. A new window will appear, choose the message. Enter additional remarks, if any. Now you can send the message to a contact group instead of manually sending to each contact. Furthermore you can also schedule as when the campaign shoud start. You can start the campaign by hitting the start icon aginst the respective campaign in campaign list. You can also stop the campaign by hitting the stop icon against the campaign in the campaign list. You can schedule it according to your own desire and you can cancel the schedule as well. In order to create the SMS Campaign, click on the SMS Campaign, it will redirect you to the Create SMS Campaign window. Now choose the SMS you want to send from a list of text, select the contact group, delay b/w calls in (millisecond), number of retires and hit the Submit button. An SMS Campaign will be created. In order to create the Voice Campaign, click on the Voice Campaign, it will redirect you to the Create Voice Campaign window. 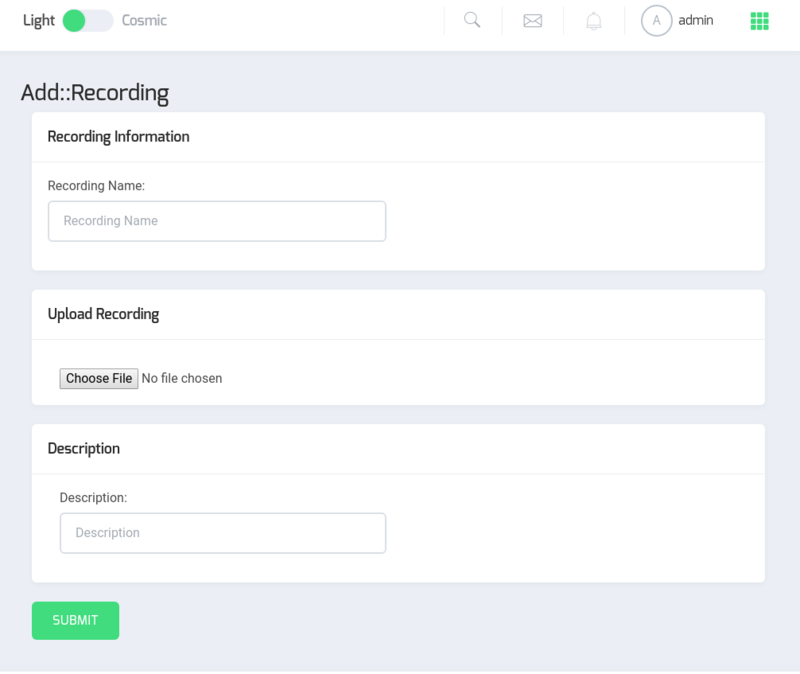 Now choose the Voice you want to send from a list of recordings, select the contact group, delay b/w calls in (millisecond), number of retires and hit the Submit button. A Voice Campaign will be created. In order to create the Email Campaign, click on the Email Campaign, it will redirect you to the Create Email Campaign window. Now choose the Email you want to send from a list of templates, select the contact group, delay b/w calls in (millisecond), number of retires and hit the Submit button. A new Email Campaign will be created. In order to create the Fax Campaign, click on the Fax Campaign, it will redirect you to the Create Fax Campaign window. Now choose the Fax you want to send from a list of documents, select the contact group, delay b/w calls in (millisecond), number of retires and hit the Submit button. A new Fax Campaign will be created. You can also update the campaign details by clicking on the edit icon against the respective campaign in the campaign list. The contact group once selected cannot be changed. You can change the message(voice, fax, sms and email) in the Edit mode. Once Edited press the update button. Now the campaign will be updated. To delete a campaign click the delete icon against the respective campaign in the campaign list. In order to manage your contacts click on the phone icon a list of contacts will appear. Here you can manage all of your contacts. You can update contact details by clicking on the edit icon against the contact name in the list. You can also delete the contact by clicking on the delete icon against the contact in contact list. In order to create the new contact click the button on the top left page of contact list. It will redirect you to the add contact window. Fill the required fields by entering the correct first name, last name, phone and email. Enter the correct phone number and password else it will show warning. Enter the required fields and press the submit button. A new contact will be created and it will redirect you to the list. Groups are an efficient way of delivering message. For example Friends Group, Customer group etc. ICTDIALER also has a feature of contact group. In case when you want to send sms, email, fax and voice message to a group of people you can use this group service to send you message to a list of people. Here you can see the list of a group. To create a group click on the Add Group button on the top left page of group list. It will redirect you to the add group window. Fill the required fields by entering the correct name, description and choose a CSVfile which contains the contacts, press the submit button. 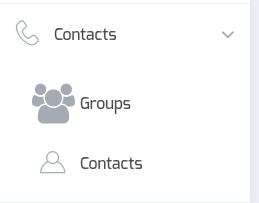 A new contact will be created and it will redirect you to the list.If you click Groups, all the contacts which are in a group form will be displayed. Here you can manage these group contacts. You can update, delete and download the contact by clicking on the edit icon against the contact in contact list. A list of different resources have been given in the side bar. By clicking it a drop down menu will open, from which desired option can be chosen. To manage the SMS click on Resources, click Text Message it will show you the list of text SMS. You can update Text details by clicking on the edit icon against the text sms name in the list. You can also delete the Text SMS by clicking on the delete icon against the text in Text list. In order to create the new text Message click the button on the top left page of text list. It will redirect you to add text window. Fill the required fields like text name, text message and any additional description and click the submit button. A new SMS Text message will be created. To manage the Voice Recording click on Resources, then Voice Recording it will show you the list of Voice Recordings. You can update Recording details by clicking on the edit icon against the recording name in the list. You can also delete, update and download, the Voice Recording by clicking on the icon against the recording in Recording list. In order to add the new voice recording click the button on the top left page of recording list. It will redirect you to add recording window. Fill the required fields like recording name, upload recording and any additional description and click the submit button. A new Voice Recording will be created. To manage the Emails click on Resources, click Email Template it will show you the list of Templates. You can update email template details by clicking on the edit icon against the template name in the list. You can also delete the email template by clicking on the delete icon against the email in email list. In order to add the new email click the button on the top left page of recording list. It will redirect you to add template window. Fill the required fields like template name, subject, message,attatchment file and any additional description and click the submit button. A new Template will be created. In order to Download the attachment click the download icon against the template in the template list. Download of HTML file/attachment will be started. To manage the Fax Document click on the Text Messages, click Fax Document it will show you the list of documents. You can update documents details by clicking on the edit icon against the document name in the list. You can also delete the document by clicking on the delete icon against the document name in document list. In order to add the new fax document click the button on the top left page of document list. It will redirect you to add document window. Fill the required fields like document name, upload pdf file and any additional description and click the submit button. A new Document will be created. In order to Download the document click the download icon against the document in the document list. Download of pdf file/document will be started. The send fax transmission will be created successfully. You can view this transmission in Transmission list and can also check its status. Similarly you can create SMS Email and Voice transmissions by following these simple steps.